The speed limit on the highway north of Alice is 130 kmh. Road trains, caravans and campers share the road. We are all travellers, passing through at high speed, our minds on our destinations. The community of the road is estranged from the country that lies to either side. The two nations rarely meet. We speak different languages and eat different food. I feel uneasy, a foreigner in my own country. And the heat, the heat! My head pounds with the oppressive heat of the glaring sun. My sense of unease grows. I feel the dark spirits of ancient murders around me. 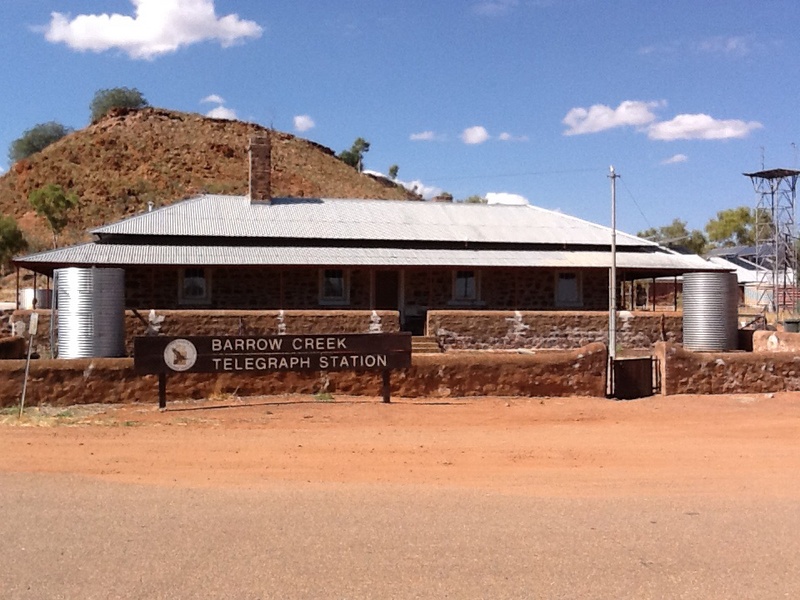 We stop at Barrow Creek where tensions between settlers and the local indigenous people have exploded over the years, with murderous consequences. In the late nineteenth century, two white settlers manning the telegraph station were killed by an aboriginal group. It is believed this was in response to fencing off a major waterhole. In reprisal, ninety men, women and children were slaughtered. Later, in 1928, a white dingo trapper was murdered. The local police carried out a bloody series of reprisals, resulting in the deaths of around 70 people. The Coniston Massacre, as this infamous event is known, was the last major massacre of aboriginal people in Australian history. The dark spirits woken by these murders have not yet been put to rest. In 2001 Peter Falconio lost his life on the stretch of road just north of here. His body has never been found. I gaze out of the window. 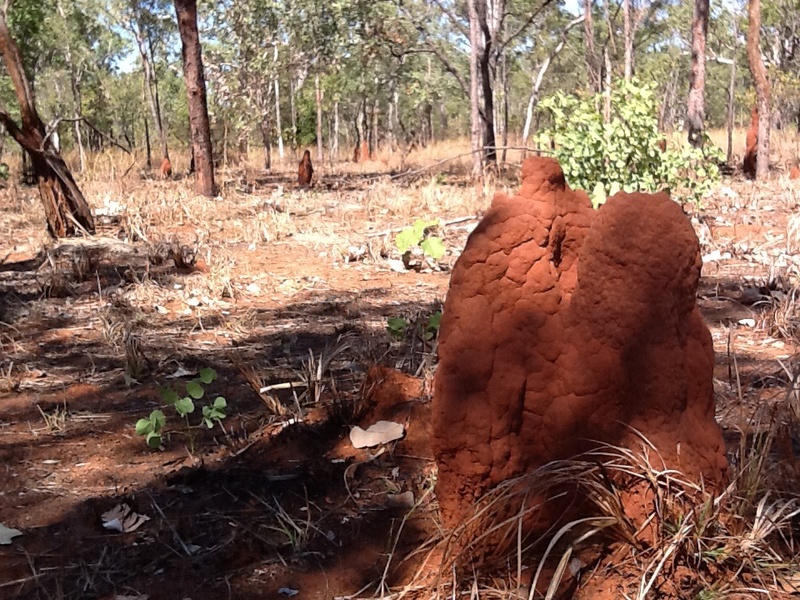 The alien shapes of termite mounds dotted between the trees look like Neolithic standing stones, cathedrals to an ancient religion. The heat intensifies. The air conditioning in the car is working hard to little effect. We pull into the ancient aboriginal dreaming site, known in four different aboriginal languages as Karlu Karlu and to white Australia as the Devil’s Marbles. My head throbs. I sit, leaning against the massive granite boulders while the others walk around the site. Perspiration wets my skin, despite the shade. I sense the rocks as a living entity, pulsing with earthly power. There is power, but no malice here. The rocks were formed through millions of years of erosion. They have lived through many generations of human experience. Their powers are beyond the comprehension of the new settlers in this land. We are too civilised to understand. But not too civilised to feel. The rocks glow in the afternoon sun as we get back into our vehicles and head for the highway. My head begins to clear as we pull away, but still the heat is unbearable. We take a detour off the highway and find a bush camp by a small waterhole. The water is so inviting, we clamber in for an evening swim. Trees frame the banks and birdsong vies with the chirp of crickets and cicadas. The cooling water washes away the unease I had felt during the day. The heat of the day fades. We relax around the campfire, eating a delicious camp oven meal cooked by Brett and Christine and turn in early to enjoy the peace of this tranquil camping spot. This entry was posted in On the road and tagged Australia, Outback, Travel on 31/05/2014 by Deb McSephney. We fly along as rutted red clay tracks become wide, easy driving unsealed roads. A squadron of budgies swoops past to check us out as we rattle across a cattle grid, the white trunks of ghost gums bright against the clear blue sky in the distance. We are on our way to a town called Alice. Phones ring out as we reconnect to the outside world. The landscape morphs again, soft green alternating with ochre stone in stripes undulating along the mountain range beside us. Black headed grasses sway in our slipstream. The roads begin to buck and roll with the mountain ranges, turning our pleasant drive into a fairground roller coaster. I gasp as the ute flies into the dips and over the crests. The Stuart Highway, the main route from Adelaide through Alice to Darwin, is the first bitumen sealed road surface we have driven on in a week. Culture shock hits us as we turn right on to the road. The Royal Flying Doctor Service Centre passes on the left, a solar power station on the right. We are back in civilisation. It’s not a good feeling. Fences and signs grate on the nerves after the wide open spaces of the desert. We lose our freedom, but gain the benefits of supermarket shopping, hot showers and counter meals. Is it worth the trade? The entry to Alice from the South is through the Heavitree Gap. This is a natural gap in the Macdonnell Ranges that allows river, road and rail to pass through. The imposing rock faces tower above as we squeeze through the opening and into Alice Springs. We take the opportunity to stock up on groceries, savour a real coffee and listen to the owner of an indigenous music shop give a sample of throaty didgereedoo music. The shop’s sales of music sticks soar as money changes hands. Everyone enjoys time to do their own thing. I visit an indigenous art gallery. Richard cleans the car from top to bottom, vacuuming out every last speck of red desert dust. The art gallery has a huge selection of work. Indigenous artists are painting in the studio behind the shop and the owner gives me a tour of the back room full of huge works, intended for corporate foyers or board rooms. The variety and quality is impressive. I am tempted by a cross hatched painting of men fishing in a canoe and a superb dot painting representing the dunes of the Simpson Desert. I will try to find time to return when we come back to Alice later on in the trip. We overnight in the Heavitree Caravan Park, just outside the gap. It is a pleasant shady camp site, but it is of course close to the road and rail through Alice. The trains seem to go on and on and on as they rattle past early in the morning. Leaving us all bleary eyed through lack of sleep. It was not like this in the Simpson. A certain competition has grown up over the last week. Who can pack away their tent first? It is not discussed, but furtive looks are cast across the campsite early in the morning. At first light the sound of kettles boiling and tents creaking can be heard. Every morning the camp is packed up earlier and earlier. Hoarse whispers are heard, “What time is it?”. “Brett’s packed away already, I don’t believe it”. The experienced crew start to get twitchy. “Relax, we’ve got plenty of time”. Of course it easy for them, the pop top campers flick away in seconds, leaving their owners to sit relaxing with a cuppa, watching the antics around them. I’m sure we can trim a few more minutes off our pack up time, but it is already down to a fine art. At 8 o’clock we head off north on the Stuart Highway. Ready for stage two of our red centre adventure. This entry was posted in On the road and tagged Australia, Outback, Travel on 30/05/2014 by Deb McSephney. The mosquitos at Mount Dare were vicious. As soon as we arrived they began to dive bomb us. We all dressed for dinner, in long trousers and sleeves for the first time in a week. In the hotel dining room the blue light of the insect destroyer sizzled and buzzed every few seconds. Despite the fly mesh on the doors, the insect invaders were breaching man’s defences. Nonetheless, spirits were high. We enjoyed the novelty of sitting around a table, eating good food that had been cooked for us. The steak and chips were declared the best anyone had ever tasted. We were all looking forward to visiting Old Andado the next day, Molly Clark’s place. We listened as Howard recounted the story of Molly. Molly was a true outback pioneer. She and her husband,, Malcolm “Mac” Clark, ran the Andado cattle station in the Northern Territory from 1955. They worked hard to build a successful business and earn enough money to own the station outright. Sadly, tragedy struck in 1978 when Mac died in an aircraft accident and in 1979 when their eldest son was killed when his truck collided with a freight train. Molly continued to run the station, but fate dealt her another blow when the station was one of the first to be tested for tuberculosis. When traces of TB were found, her entire stock had to be destroyed. There was no compensation or insurance policy to cushion her from the loss and in 1984 she lost the property they had worked so hard to own. It was sold for a pittance. Not one to give up easily, three years later Molly was back. Not in the new homestead that had been built, but having secured a lease around Old Andado, the original property homestead. She lived there for almost thirty years, welcoming travellers who visited and wanted to experience a little of the true outback life. Molly died in 2012 and left the property to her five grandchildren who set up a trust to retain the property. Some of our group had met Molly on their last visit and we now planned to return to pay our respects. The house has been retained exactly as Molly left it and gives a unique insight into the reality of living in the outback. The next morning we set out on the road to Molly’s place. The red clay roads were deeply rutted and no one was surprised when after kilometres of picking a track through the damaged road surface a sign announced “Four Wheel Drive Recommended”. We crossed the border from South Australia to the Northern Territory and followed the track through a working cattle station. We were still on the margins of the Simpson Desert, but as we drove further into The Territory, the land grew greener and greener. Lush paddocks dotted with trees, it suggested parkland rather than an arid desert. “This is no way to show the outback!”, exclaimed Olive. Having seen this area in drier times, she was afraid we would get the wrong idea and imagine that the arid country always looked this way. The miracle of good rains had revealed the underlying fertility of the red clay. The cattle had shiny, glossy coats and were alert and happy. Grasses, wildflowers and trees were all growing fast in the warmth and the wet. We drove through red clay pans that were tinged with green and even had to splash our way through pools of water covering the track. The clear blue sky and clay red land reflected in the water caught my painterly eye and I longed to set up an easel and capture the colour combinations. A photo had to do. When we finally reached Molly’s place at Old Andado and looked down over the property, we were expecting tragedy but found a verdant paradise. The overall impression was of a fertile coffee plantation in some exotic land and not an arid Australian cattle station where it was a battle to survive. Such is the power of life-giving rain. The tour of Molly’s house was moving. It was if she had just stepped out for the afternoon. The contents of the house were complete, allowing us to see the detail that made up her day to day life. Everything from biscuit tin to teapot, from bookshelf to Australian flag remained. Her presence in the house was strong, making this more than just a living museum to late twentieth century outback life. I did not feel any need to mourn Molly. She would have tut tutted at that nonsense. But although I never met her, I felt I knew her and respected her. The house will not stand forever, but her legend will, I am sure, live on. We drove away with respect for a way of life now all but gone. On the road again. A short detour off our route to Alice Springs took us to the Mac Clark Acacia Reserve. The reserve protects a stand of extremely rare acacia (wattle) trees, the acacia puece, or waddy-wood. They are found only in three locations in the world. Here in the Northern Territory and in Queensland. They live for hundreds of years and yield extremely hard wood. So hard a nail cannot penetrate it. We stood and marvelled at these tall spiky trees standing in red earth encrusted with glossy black stones. They looked a little like pines, or she oaks, but their leaves were not pliable. They grew steely needles, like animal spines. Yet their seed pods were pale green, like snow peas, and almost succulent. A remnant of the tall forests that shrouded this land in days gone by. 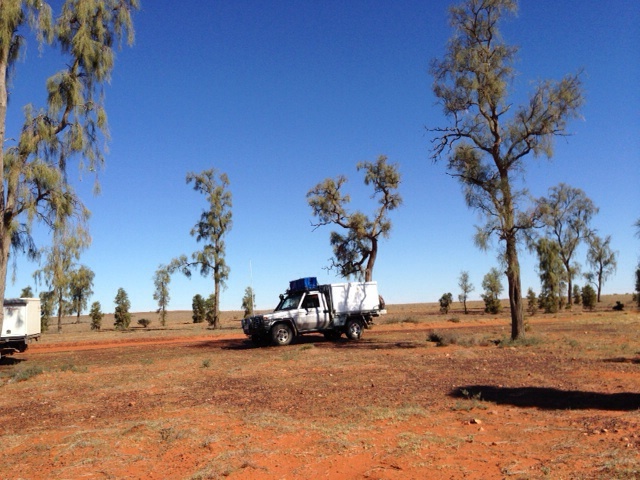 With still 200 km to travel to Alice Springs, we decided to find a camp spot just off the track. Howard spotted a site nestled below towering rocky sandstone hills. The convoy stopped to make camp. We watched the colours change in the sky as the sun went down, while Howard and Malcolm scaled the rocky heights above us. This entry was posted in On the road and tagged Australia, Molly clark, Outback, Travel on 29/05/2014 by Deb McSephney. 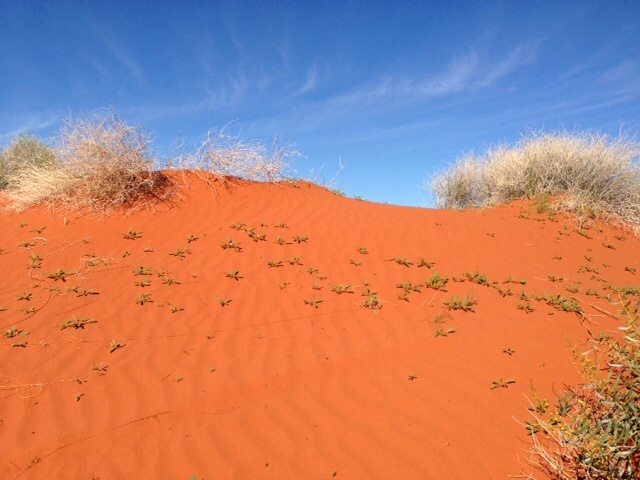 Today is our second day driving through the Simpson desert. I can share with you, dear reader, that it is unusually beautiful here. The colour of the sand, which varies from a creamy tan to a dusky pink, is a constant contrasting backdrop to the greys, greens and yellows of the vegetation. Wildflowers are unexpectedly prolific. We are lucky to see the desert in bloom. Flowers of yellow, white and mauve compete for attention with wattles decorated with yellow pompom flowers, with the complex geometric shapes of clumps of sand hill cane grass and spiky tufts of spinifex. I take hundreds of photos. I want to capture the memory of these sights and savour it forever. We are not alone here. The desert is alive, but we see few of its inhabitants. The sand is traced with a multitude of prints, giving away their secret nocturnal existence. Dingo tracks follow the road for many kilometres. Tiny birds fly from bush to bush. Emus are spotted walking across the sands. A lizard slithers by. The ecosystem is alive and well, thriving on recent rains. Our vehicles are tested by the harsh conditions and relentless low gear four wheel driving. They rock and roll as they climb the dunes. They shake and rattle as they twist and turn and any loose items are thrown about inside. A milk container is cracked, glass and plastic broken. Batteries fail and fuses blow. Fridge contents are thrown around as if in a blender. But the utes drive on, revelling in an opportunity to exercise their full capabilities. Few road cars ever have this work out. We travel slowly at approximately 20 km/hr, looking out for other vehicles coming towards us on the track. Through the day we meet seven vehicles driving from West to East, the opposite direction to us. Nearing the end of the day, a large sand dune stops Howard in his tracks. As he is reversing down, an oncoming vehicle appears on the crest above him. A close call. This last dune is going to be a difficult one to climb. It is deceptive. Approaching what appears to be the top, a second hidden summit emerges. It is two dunes in one. The sand at the top is soft. One by one the vehicles attempt the climb. First hard right, then hard left. After a few false starts everyone but Max is over. The V8 roars and here he comes, up to the right, then to the left. A glimpse in through the windscreen and we can see Max relaxed, a cigarette in his mouth, totally at ease as he twists the wheel and the Landcruiser ploughs through the sand to reach the summit. A cool customer. The shadows are long in the late afternoon sun and we stand on top the dune for a while to take in the view. The desert stretches out below us. A spectacular end to another perfect day. 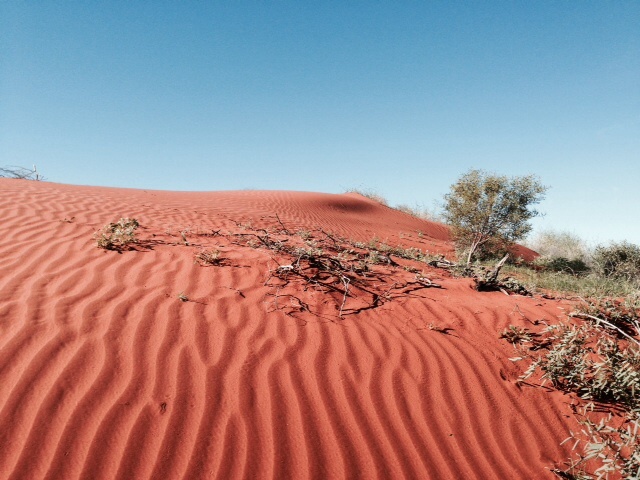 This entry was posted in Desert, Max, On the road and tagged Australia, desert, Outback, Travel on 27/05/2014 by Deb McSephney.